Dark skin on the hips, regardless of the cause, is very confusing for both men and women. People can associate this phenomenon with poor hygiene or even previous sexually transmitted infections, while this may not be the case. 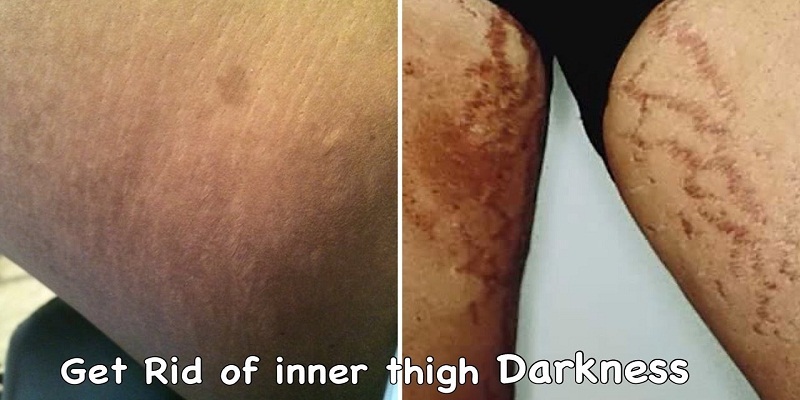 There are many causes of the dark skin between the thighs, which can spread the problem of discoloration of the skin on the groin, the bikini area, and other areas. People with obesity often find a problem with the skin on their thighs, because they fit tightly and at the same time constantly rub each other when walking or training, which “can cause discoloration and itching of the skin, a condition called irritation. To avoid this problem, you should always wear loose pants, avoid synthetic fibers, including nylon, because they cause even more irritation. We must try to wear clothes made from natural fibers, especially cotton. Excessive friction and sweating between the thighs can darken or blacken them. Also, wearing very thick clothes only exacerbates this problem. Therefore, wearing loose, breathable clothing can improve skin condition, if that is the cause. Also, dark tight jeans should be avoided. Hormonal imbalance is a common factor in the darkening of skin areas for some women. It can be said that the cause is a hormonal imbalance if the inner sides of the thighs darken in some circumstances when hormonal changes are present, for example, during menstrual cycles, lactation or pregnancy. Also, with the polycystic ovarian syndrome (PCOS), dark spots on the thighs or even in the armpits may form, which is why PCOS is also associated with this problem. Excessive exposure to direct sunlight, especially during sunbathing, can lead not only to darkening of the skin on the thighs but also to dark areas on their inner surface, if sunburn occurs. Some drugs, such as oral contraceptives, have been found to cause discoloration of the skin on the inside of the thigh. If this problem occurs while taking certain medications, you should consult your doctor to find out if these drugs can provoke it. This condition often causes discoloration, as well as dark spots on the skin, including the hips. For some people, this problem occurs due to closely spaced bones or a lack of space between them. Often occurs in people with excess weight, as described above. Frequent shaving can cause darkening of the skin on the inside of the thigh. This problem is mainly found in people using old razors, which irritate the skin and thereby make it darker. Studies have shown that insulin resistant people often suffer from the darkening of the hips. Perhaps these states have a connection. In this case, dark skin can be observed around the neck, in the armpits and other parts of the body. There are many other causes of this problem, for example, the use of some care and perfume products that can cause skin reactions, aging, and chemicals found in sweat, poor ventilation, and others. Their presence may have nothing to do with the darkening of the skin on the inside of the thigh. They are caused by many other reasons that have nothing to do with color change. However, in some cases, dark spots or bumps may be caused by some of the above reasons, such as shaving the hair in the bikini area. Other causes of these conditions include supportive hid adenitis, folliculitis, abscess, moll scum contagious, or warts. Here are many home or natural skin whitening products between the thighs. Below are 10 to the most effective ways. “Lemon juice acts as a natural whitening agent” (thehealthsite.com) and helps get rid of any dark spots. On the other hand, coconut oil is a good brightener for dark skin of feet and other parts of the body. Also, it will keep the skin hydrated, as the lemon can cause its dryness. Massage the skin between the thighs for about 15-20 minutes with this product. Rinse with warm water and dry with a dry, clean towel. Then you can apply olive or coconut oil to moisturize. If you use only lemon juice, you need to wash it off after 15 minutes, and then use olive oil. Cottage cheese is useful for moisturizing the skin. It also has whitening and acidic properties that will prevent any infections, while lemon has whitening properties. A squeeze of the juice from the half a lemon and add about a teaspoon of sour curd. Add a little (pinch) chickpea flour or turmeric to this mixture. Apply the product to the dark skin between the thighs and let it dry. Rinse the hips and dry. Sugar helps exfoliate dead skin cells, honey moisturizes it, while lemon helps reduce pigmentation. Rub the resulting thigh paste in a circular motion until the sugar disappears. Leave for 10 minutes, rinse with warm water. Tomato juice and potato juice work well as bleaching agents for the inner side of the thigh or any other part of the body, but they are especially suitable for people with sensitive skin. On the other hand, honey has moisturizing and soothing properties. This tool is well suited for persistent dark spots. Wash off the paste after 5-10 minutes and blot dry with a towel. Sandalwood and cucumber work well as “natural cooling substances that soothe the delicate skin between the thighs. Apply and leave to dry. Almond oil will help lighten the skin, as it contains large amounts of vitamin E. Milk and honey nourish the affected area and stop any infections. Apply the agent and leave for 15 minutes. Oats well exfoliate the dark skin on the inner thigh, while cottage cheese makes it smooth. Honey has strong antibacterial properties and can protect against infections. Clean the skin with water after a few minutes, and then dry with a towel patting movements. Aloe Vera helps to reduce inflammation and also quickly regenerates the skin and can be used for any surface. On the other hand, the almond oil contains vitamin E, which will lighten dark areas. Mix a few drops of almond oil with about two tablespoons of Aloe Vera gel. Rinse when skin becomes sticky. Orange peel contains a large amount of vitamin C, which works as a natural whitening agent. When used with honey, we get smooth, soft skin without any blemishes. Apply the paste and rinse after about 15 minutes. For flawless and soft skin of the inner side of the thigh, you can use a mixture of lemon, rose water and glycerin. These ingredients will also lighten and moisturize it. Apply before bed and leave overnight. In the morning while taking a shower wash off. Sesame or sunflower oil can also be used for massage for about 5 minutes, then wash it off. Note. It is recommended not to use soap, as it can provoke sweating. If the skin is sweating, you can use talc. Also, if wounds, cuts or irritations are present, you must first wait until they heal before using any of the above home remedies. Injections and tablets for bleaching. Most of these specialized procedures are expensive. To get rid of the darkening of the skin between the thighs, you can try various creams available on the market. Some, such as hydroquinone cream, may require a doctor’s prescription. Mrs beau placenta – cream for whitening underarms and dark spots 50g. Buying any cream, it is worth checking its composition. Some of the beneficial ingredients to look for include “comic acid, retinoid, atelic acid, and glycolic acid,” according to DermeDoctor.com. Also, information about the effectiveness of creams can be found in online reviews, ratings and user comments. Stop wearing tight-fitting clothes, as well as one that is made of synthetic fibers, because it leads to darkening of the skin between the thighs. If you are overweight and your hips rub against each other, an excellent solution would be to get rid of it. To Reduce Rubbing, You Can Apply Petroleum Jelly. You should eat a lot of fruits, vegetables, and at least eight glasses of water daily. Fresh vegetables and fruits, such as berries, oranges, have an antioxidant, which is useful for reducing the darkening of the skin.